Get Well Soon Wishes, basket for when your little one is sick. When my little one isn’t feeling well we make her a Get Well Soon Wishes Basket! I hate when my little one isn’t feeling the best. When she’s feeling sick, it makes me so sad. There’s really not too much we can do to make them instantly feel better, or is there? 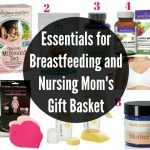 We always do a basket like this when my little one is sick or hurt. I think it really helps them feel better! It’s not too pricey and you can easily do it for whatever budget you have. 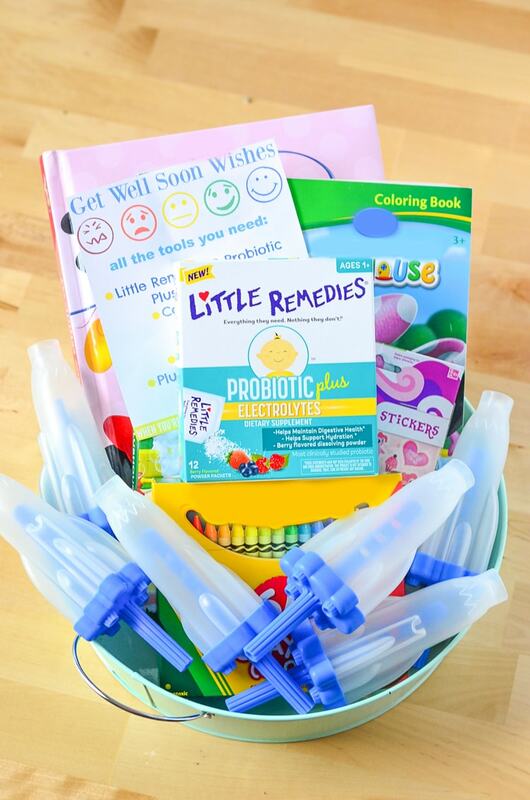 You can customize your get well soon wishes basket however you’d like for your little one. This is my first run on being a mom with my little one and I have learned a few things. We use natural remedies like hugs, kisses, presents, chicken soup, and probiotics when we’re sick. These have always helped in many ways. 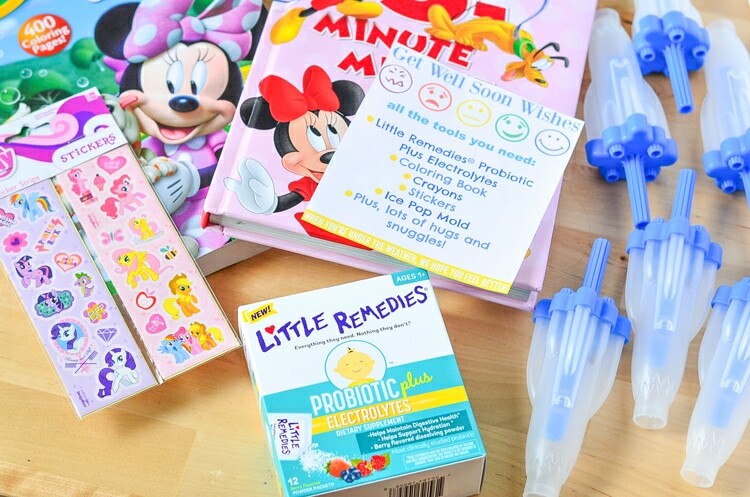 My daughter takes a daily probiotic and we just found out about the NEW Little Remedies® Probiotic + Electrolytes. 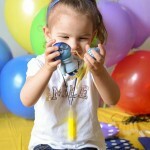 This is great for kiddos who are sick and especially now that the summer is approaching. Probiotics are good for everyone to take daily and with the added electrolytes you can make sure your child is getting proper hydration. 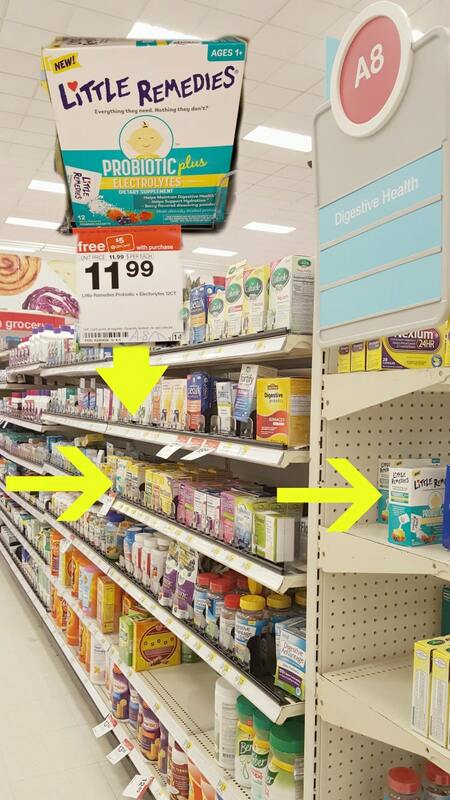 You may know Little Remedies from their Gripe Water and/or Gas Relief Drops, which can be found at Target. My daughter is pretty good about taking all of her daily vitamins, although sometimes there’s a struggle. Some just don’t taste good. She was doing really well with a probiotic and then they changed their formula. It’s now tart and has an extremely weird bitter aftertaste. So then we turned to powdered, but I have to make a smoothie every time she takes it since it’s not flavored and she refuses to have it in water. 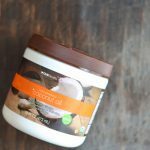 This is why we’re crushing on Little Remedies Probiotic + Electrolytes! 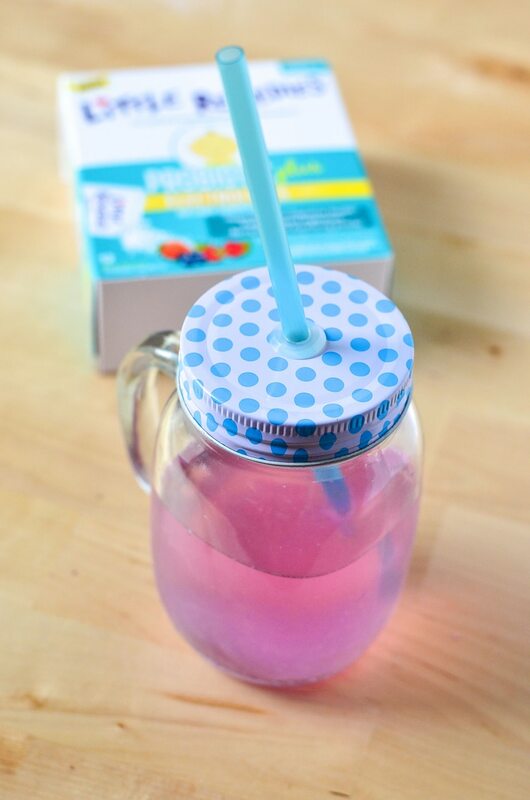 It helps maintain digestive health, supports hydration, and it’s berry flavored. 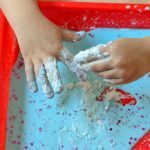 It dissolves easily in water too! I appreciate that it has no artificial flavors or dyes and it’s gluten free also. Being gluten free is extremely important, as gluten can really upset the stomach. It comes in a convenient little packet that make it easy to take on the go! Why should we take probiotics? They are a live bacteria (yeasts) that work on our digestive system and overall health. Our bodies are filled with bad bacteria even when we’re feeling well, and by adding a good bacteria, like probiotics, we’re keeping our gut healthy, which keeps us healthy! It’s especially important to get probiotics when you’re taking any type of antibiotic, as antibiotics kill both good and bad bacteria. Since our little one suffered from FPIES (what is fpies?) we feel it’s even more important to make sure she has a healthy gut. Not every parent knows how good probiotics are for them, let alone their little one. 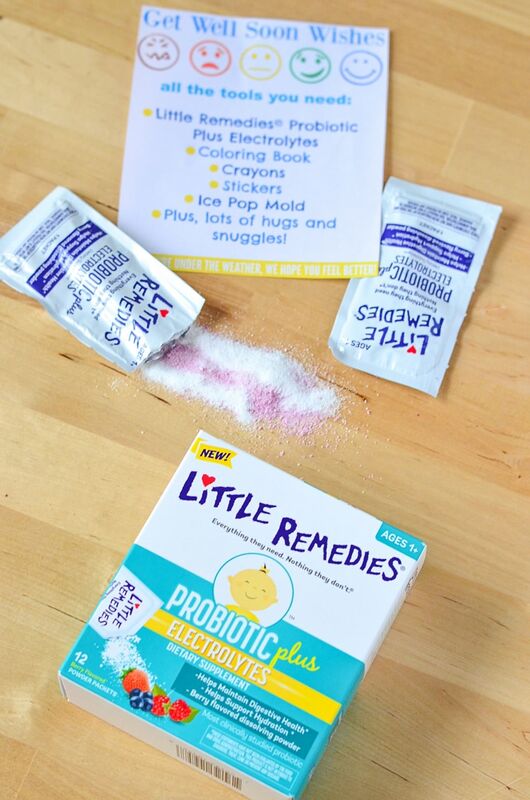 Little Remedies Probiotic Plus Electrolytes contains 5 billion active cultures of the probiotic Lactobacillus rhamnosus GG and helps keep all your child’s gut health balanced while also supporting immune function. The next time you find out someone is sick or not the feeling their greatest and you want them better quick, make our Get Well Soon Wishes Basket for them! 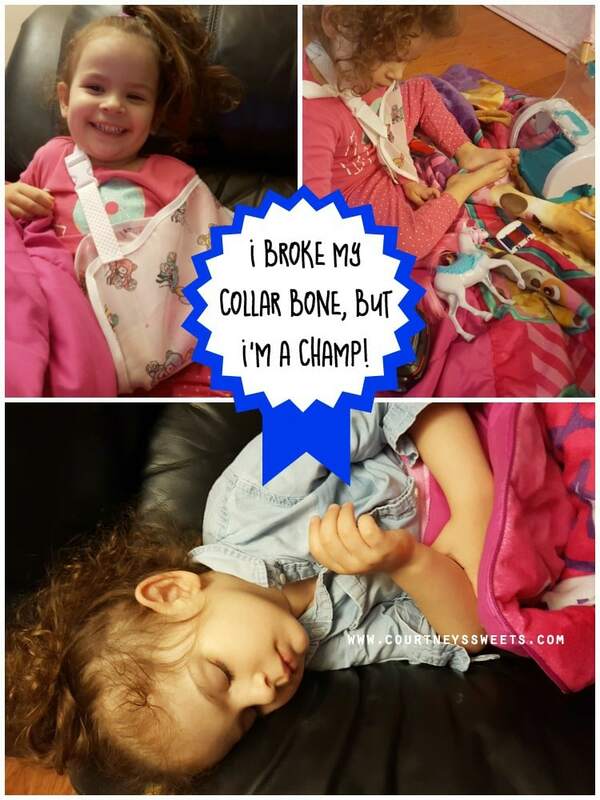 It has everything a child needs to feel better soon. 🙂 Don’t forget about the $5 Target Gift Card offer! 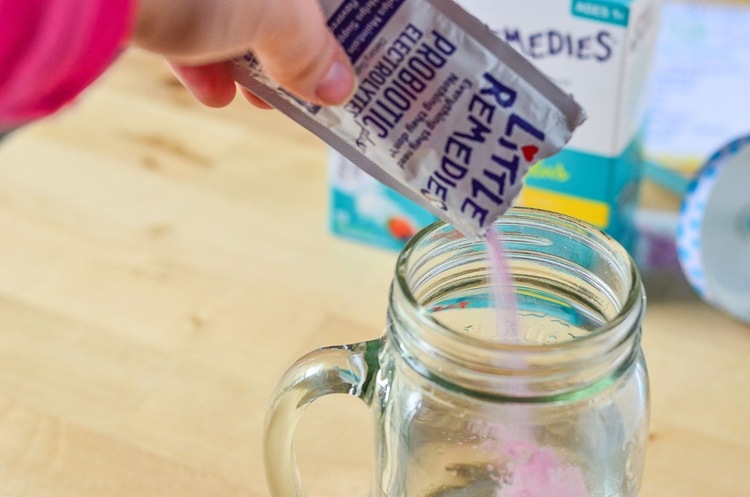 Click here to find out even more reasons to love and use Little Remedies® Probiotic Plus Electrolytes! Click below to get your free printable to make your very own Get Well Soon Wishes Basket! 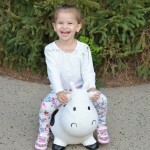 Connect with Little Remedies on Twitter and Facebook!